Is It Time for a New Tradition? “Many of the jobs that will employ our children and grandchildren have yet to be created. Does anyone remember the true meaning of Labor Day? Like, why is it celebrated at all? Jay Zagorsky’s piece in The Conversation asks that very question. Other than sleeping in a little later or sipping a frosty while lamenting the end of another summer, what else is there to this century-old American and Canadian holiday? Tradition says that back in the 1890s the holiday was a one-day reprieve from the toil of non-stop labor. The 40-hour work week was still 40 years off in the Fair Labor Standards Act of 1938 that also included minimum wage, overtime pay and an end to oppressive conditions like no bathroom breaks, no benefits or sick pay and no safety standards. Easy to see why those grim memories have been a forgotten part of an otherwise cheery, end-of-summer holiday. Maybe it’s time for a new tradition. Instead of a holiday celebrating rescue from past labor struggles, maybe a holiday that honors the struggle to stave off future labor woes might be a worthy cause. Maybe a Labor Day that looks forward rather than back. Annually, maybe the first Monday in September could be set aside to celebrate efforts to remedy humankind’s future of automation in the workplace—rescue from all that impending angst over robots, artificial intelligence and job loss that these days seemingly everyone is anticipating with dread. A Labor Day that honors organizations and individuals who are making change happen for a better work future could well make for a super holiday. One organization that may earn considerable praise at a future Labor Day is a nascent group recently organized in San Francisco and Washington, DC that calls itself The EMMA Coalition. Saving capitalism and reforming labor markets is a mighty tall order for governments to take on, let alone for a new non-profit. An ambitious challenge, to say the least. It’s also remarkable and admirable that EMMA has chosen to joust with the mega-issues of our day. The EMMA Coalition’s manifesto is a 9-page document that plainly lays out the genesis of the group and what it intends to do about the future of work and the workplace: The EMMA Coalition: The Next-Collar Jobs for the Now Future (August 2018). EMMA was conceived by and is a product of two closely aligned organizations: Littler, a San Francisco-based law firm, through its Workplace Policy Institute, and Robotics, AI & Automation Practice Group, together with Washington, DC-based consultancy, Prime Policy Group. 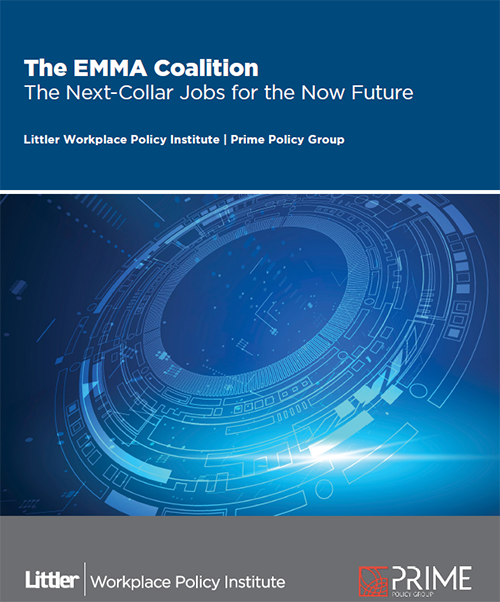 Free copies of The EMMA Coalition: The Next-Collar Jobs for the Now Future are available, contact Michael Lotito, head of Littler’s Workplace Policy Institute. The EMMA Coalition begins its very interesting document by trotting out all the standard bad news about millions losing their jobs to artificial intelligence and robots by 2030; the kind of fearsome stats that seem to haunt us these days like a bad dream. EMMA names this impending scenario, TIDE, an acronym for the scary-sounding Technology-Induced Displacement of Employees. See TIDE report: The Future Is Now: Workforce Opportunities and the Coming TIDE (June 18, 2018). However, this new non-profit then follows up TIDE with the truly unusual: The EMMA Coalition’s…solution! Yes, a solution. EMMA presents a solution, a remedy to the plight of TIDE. A solution…not scaremongering; that’s the unusual part. That’s something one never hears from any quarter. Aside from being true, that’s an unusually and refreshingly frank statement. Plus, it’s energetic, forward looking, and brimming with confidence. That’s a mouthful of action verbs for any one organization to take on: Organize, establish, outreach, form, and create. However, there’s simply no faulting such a magnanimous offer, especially so because there’s no similar offer coming from anywhere else. That’s the amazing part: Why is it that only The EMMA Coalition has come forward with such a plan? The EMMA Coalition is decidedly fresh air for a world grown bone weary of chasing AI demons around their workplaces and from the daily stress of workers fearing for the fragility of their careers because of technological disruption. The EMMA Coalition is stepping up right into the face of it all…and just in the nick of time. The world is looking for action heroes ready and willing to contend with and make sense out of the roiling clash of automation, people and jobs. As such, one cannot help but root for the success of the venture that The EMMA Coalition has cut out for itself. Short of reversing climate change or curing cancer, it’s the biggest of jobs. And as big jobs go, it’s certainly more than admirable enough to put some real meaning back into Labor Day.